TMR exists between an alternative art space and a series of research-driven, multi-faceted exhibition projects. Our program is organized in rotating curatorial cycles that vary in structure, duration, and thematic focus. Each cycle is conceived as a world in its own right and as such is given shape by unique exhibitionary, experiential, and discursive forms and moments. 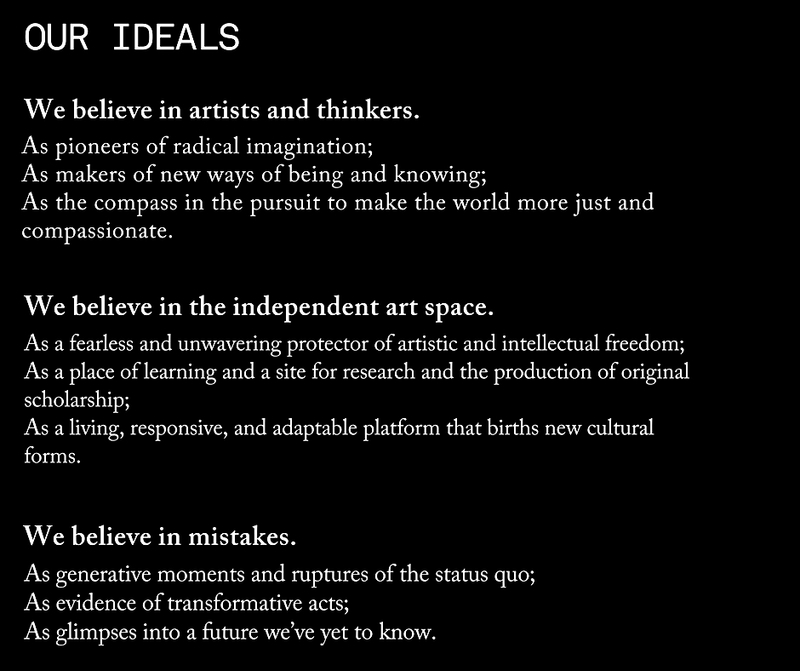 This approach allows the dreams and needs of our collaborators to guide what we do and how we do it—challenging us to constantly reimagine not just the ways contemporary art and other forms of creative expression are presented but also how they are produced and mediated to existing and future publics. Committing sustained periods of inquiry to specific questions, contexts, and practices, facilitates our ability to produce original scholarship and to make meaningful contributions to the study and interpretation of art and culture. Established in 2014, TMR operates from a renovated industrial warehouse along the Alameda Corridor at the southernmost edge of Downtown LA’s Arts District. The use of our physical venue changes according to each curatorial cycle. Its purpose however, remains constant—to be a dynamic nexus through which Los Angeles connects to people, places, and histories well beyond its confines. Aaron Horst, Eduardo Sarabia at The Mistake Room, CARLA, December 2017. Sharon Mizota, Eduardo Sarabia's dream world in L.A., by way of Guadalajara, LA Times, November 14, 2017. Casey Dison, Sarabia's Divide, Artblitz, October 14, 2017. Kaeli Deane, Field Notes: Pacific Standard Time LA/LA, PHILLIPS, September 28, 2017. Gwynedd Stuart, Your Guide to SoCal's Biggest-Ever Latinx and Latin American Art Event (Part 1), LA Weekly, September 15, 2017. Editorial, PST: LA/LA Neighborhood Guide, Discover Los Angeles, September 13, 2017. Simone Krug, Analog Currency, The Brooklyn Rail, September 7, 2017. Travis Diehl, Western Art and Mexican Culture Collide in the Work of Eduardo Sarabia, Frieze, September 2017. Editorial, Borusan Contemporary Presents Diana Thater, ArtFix, August 11, 2017. Travis Diehl, Books = Yes!, XTRA, Summer 2017. Alexander Keefe, Diana Thater, Review, Artforum, Summer 2017. Jody Zellen, Diana Thater at The Mistake Room, Art and Cake, May 3, 2017. Catherine Wagley, 5 Art Shows to See in L.A. This Week, LA Weekly, May 3, 2017. Lorraine Heitzman, Thomas Hirschhorn: Love, Politics, Aesthetics, and Philosophy at The Mistake Room, Art and Cake, December 14, 2016. Ciara Moloney, Thomas Hirschhorn: Stand Alone, ArtReview, December 2016. The Mistake Room presents Thomas Hirschhorn, Fabrik, November 4, 2016. Natalie Hegert, Dimensions Variable: Art Installations, Interventions, and Environments To Experience This November 2016, Mutual Art, November 2, 2016. Christopher Michno, Review: Thomas Hirschhorn, Artillery Magazine, October 26, 2016. Sharon Mizota, What to see in L.A. galleries: An ode to a black sci-fi trailblazer and Lari Pittman Mood Books', LA Times, October 21, 2016. Catherine Wagley, Thomas Hirschhorn at The Mistake Room, Contemporary Art Review LA (CARLA), October 21, 2016. Editorial, Thomas Hirschhorn: Stand-alone, en The Mistake Room, Código Magazine, October 13, 2016. Carolina A. Miranda, Datebook: Monuments made of cardboard, the Virgin of Guadalupe's legacy, the art of alchemy, LA Times, October 6, 2016. Matt Stromberg, ArtRX LA: Thomas Hirschhorn: Stand-alone, Hyperallergic, October 4, 2016. Allison Berg, Enjoy the View, C Magazine, October 2016. Andrew Nunes, Mexican Art Collective Turns LA Gallery into Cult Headquarters, The Creators Project, September 9, 2016. Catherine G. Wagley, Aggressively Mischievous: Gabinete H-E Descends On The Mistake Room In Los Angeles, ARTNEWS, September 1, 2016. Hunter Drohojowska-Philip, Summer group shows and Mark Gash, KCRW: Art Talk, August 4, 2016. Aumenta tus conocimientos en el arte, El Informador, July 26, 2016. The Mistake Room presents Destroy All Your Humanity, Fabrik Media, July 19, 2016. Arden Shore, A Tour through Space with LA Artist Glenn Kaino, Citizine, July 18, 2016. Carolina A. Miranda, Datebook: A show about the border, art inspired by L.A., an exhibition with its own marijuana strain, LA Times, July 14, 2016. Matt Stromberg, ArtRx LA: Destroy All Your Humanity, Hyperallergic, July 12, 2016. Honora Shea, Critic's Picks: Exquisite Corpse, Artforum, June 1, 2016. Ari Simon, Review--HOUSE MUSIC: A Residency, Get Downtown, May 5, 2016. Vivian Hua, HOUSE MUSIC Performance Review: Jennie Liu & Andrew Gilbert Practice at The Mistake Room, Redefine Mag, April 26, 2016. Simone Krug, Histories of a Vanishing Present: A Prologue, Review, Contemporary Art Review LA, Spring 2016. Matt Stromberg, ArtRx LA: House Music: A Residency, Hyperallergic, April 19, 2016. Cesar Garcia, Jim Shaw & Daniel Guzman: Artistic Revolution, Interview, NeueJournal, April 18, 2016. Mike Kelley Foundation for the Arts Announces Recipients of Inaugural Grants, Artforum, April 6, 2016. Deborah Vankin, Mini golf in downtown L.A.? That and other arts projects win grants from Mike Kelley Foundation, LA Times, April 5, 2016. Thisbe Gensler, Histories of a Vanishing Present: A Prologue at The Mistake Room, Los Angeles, Art Observed, February 20, 2016. Shana Nys Dambrot, TOP TEN 2015: LOS ANGELES, art ltd., January/February 2016. Victoria L. Valentine, On the Horizon in African American Art: Artists to Watch and Events to Look Forward to in 2016, Culture Type, January 11, 2016. Carol Kino, Influencers: Cesar Garcia, Art Basel Miami Magazine, December 2015. Degen Pener, Not For Sale, Cultured Magazine, Winter 2015. On View: Cao Fei’s “Shadow Plays” Explores The Rapid Pace of Chinese Development, The Architect’s Newspaper, November 16, 2015. Carolina A. Miranda, Cao Fei’s Beijing zombies in L.A. serve as a riff on modern China, LA Times, October 23, 2015. Sharon Mizota, Review: The recession and its discontents in films by Cao Fei at The Mistake Room, LA Times, October 16, 2015. Catherine Wagley, 5 Art Shows You Should See in L.A. This Week, LA Weekly, September 24, 2015. Kris Kuramitsu on Cao Fei’s Anxious Urban Visions, LA Forum, September 20, 2015. Carolina A. Miranda, Datebook: Zombies of Beijing, Chicano landscapes, fountain sculptures, LA Times, September 18, 2015. Alexandria Symonds, The Cultivist’s Top 12 International Hidden Art Gems, New York Times (T Magazine), August 5, 2015. Q & A: Cesar Garcia, Founding Director of The Mistake Room, Modern Painters, July 19, 2015. Matt Stromberg, ArtRx LA: Carlos Amorales: A Film Trilogy, Hyperallergic, June 9, 2015. Travis Diehl, Critics Picks: Milena Bonilla, Artforum, June 8, 2015. The Agenda: This Week in Los Angeles, Art in America, June 3, 2015. The Mistake Room Gala, LA Confidential, May/June 2015. Catherine Wagley, Milena Bonilla: Low-Intensity Operations, LA Weekly, April 22, 2015. Regina Mogilevskaya, The Mistake Room’s First Biennial Gala, ArtInfo, April 2, 2015. The Mistake Room Gala, Cultured Magazine, April 2015. John Chiaverina, Simon Fujiwara and Samara Golden Win Inaugural Mistake Room Artist Prizes, Artnews, March 12, 2015. In The Air: Simon Fujiwara and Samara Golden Win Mistake Room Prizes, ArtInfo, March 12, 2015. Simon Fujiwara and Samara Golden Awarded Mistake Room’s 2015 Artist Prizes, Artforum, March 12, 2015. Sharon Mizota, Review: Vivian Suter at The Mistake Room, LA Times, March 11, 2015. M.H. Miller, L.A.’s Mistake Room Will Honor Isaac Julien at First Biennial Fundraiser, Artnews, February 18, 2015. Catherine Wagley, Paulo Bruscky: Artist Books and Films, 1970-2013, LA Weekly, January 28, 2015. Carolina A. Miranda, Datebook: Brazil artist books, underground photos & Guerrilla Girls, LA Times, January 15, 2015. Editorial, Curators To Watch in 2015, as Chosen by Art-World Insiders, Artsy, December 18, 2015. Catherine Wagley, 10 Best L.A. Art Experiences 2014, LA Weekly, December 17, 2014. Degen Pener, A Comprehensive Guide for Giving Back in Los Angeles, LA Confidential, December 1, 2014. Cesar Garcia: L.A. Art Scene Renegade, Cultured Magazine, December 2014. Jennifer S. Li, Reviews: Korakrit Arunanondchai, Art in America, November 25, 2014. Christopher Wyrick, Room for Error—Los Angeles, Monocle Magazine, November 2014. Shana Nys Dambrot, Best Experimental Kunsthalle (2014), LA Weekly, October 3, 2014. Top 5: October 16, 2014, Glasstire, October 1, 2014. Jonathan Griffin, Review: Korakrit Arunanondchai, frieze, October 2014. Courtney Malick, Korakrit Arunanondchai with Courtney Malick, SFAQ, September 19, 2014. The Agenda: This Week in Los Angeles, Art in America, September 17, 2014. Matt Stromberg, ArtRx LA: Cities on Screens: Film Works by Gordon Matta-Clark, Hyperallergic, September 16, 2014. Christine N. Ziemba, 24 Of Our Favorite Events in Los Angeles This Week, LAist, September 15, 2014. Dorothée Dupuis, Forms of Exchange (Korakrit Arunanondchai Review), Spike Magazine, September 2014. Keith Plocek, Korakrit Arunanondchai and the Cult of Bar Soap at The Mistake Room, Glasstire, August 21, 2014. Rachel Mason, Taking a Trip Into Korakrit Arunanondchai’s World, Huffington Post, August 12, 2014. Catherine Wagley, Korakrit Arunanondchai, LA Weekly, July 30, 2014. Cathleen Cher, Krit, Boychild and The Mistake Room, Milk, July 18, 2014. 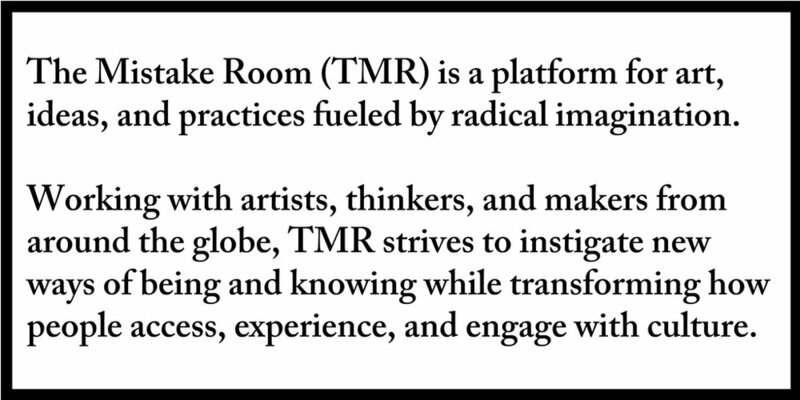 Deborah Vankin, The Mistake Room brings global view to gritty downtown L.A. art scene, LA Times, July 18, 2014. Honora Shea, Korakrit Arunanondchai’s Body Work, Interview Magazine, July 16, 2014. Nate Freeman, Director Your Attention to a Wonderfully Loopy Exhibition Trailer From Korakrit Arunanondchai, Observer, July 10, 2014. Amanda Millin, Making a Mistake, Robb Report, June 6, 2014. Art Movement: Go-To Galleries, Details Magazine, June 2014. Shana Nys Dambrot, Cesar Garcia: A Gallery Director Not Afraid of Making a Mistake, LA Weekly, May 14, 2014. Susannah Tantemsapya, Q&A: Cesar Garcia on The Mistake Room, Korakrit Arunanondchai and Oscar Murillo, MDaily, May 7, 2014. Oscar Murillo: Distribution Center at The Mistake Room Through April 12th, 2014, ArtObserved, April 10, 2014. Oscar Murillo in conversation with Cesar Garcia, On The Seventh Day (We Don’t Work Sundays), L’Officiel, March-April 2014. Maxwell Williams, Counter Culture: Cesar Garcia and The Mistake Room challenge L.A.’s art identity, Cultured Magazine, Spring 2014. VIDEO: Oscar Murillo Show Opens LA’s Mistake Room, Artinfo, March 18, 2014. Susan Michals, Want to Get Your Very Own Oscar Murillo for $1,000?, Huffington Post, March 11, 2014. Benjamin Sutton, Inside the Mistake Room, Los Angeles’s Newest Art Space, Artnet, February 20, 2014. Fan Zhong, Oscar Murillo Makes No Mistake, W Magazine, January 21, 2014. Maxwell Williams, Downtown L.A.’s The Mistake Room Art Space Celebrates Opening, The Hollywood Report, January 20, 2014. Deborah Vankin, Cesar Garcia’s the Mistake Room opens in downtown L.A., January 18, 2014. In The Air: L.A.’s Mistake Room Launching With Oscar Murillo Show, Artinfo, January 16, 2014. Abhilasha Singh, Los Angeles Gets a New Major Contemporary Art Space, January 15, 2014. Susan Michals, The Mix Master, Angeleno Magazine, December 2014. The Mistake Room Benefit and Launch Brings Big Artists To Los Angeles, Huffington Post, October 11, 2013. Susan Michals, It’s No Mistake: The Mistake Room Launches As a Landmark Art Organization in Los Angeles, Huffington Post, October 17, 2013.